Recommended Growing Conditions RPMI-1640 + 2mM Glutamine + 2mM Sodium Pyruvate + 10% Foetal Bovine Serum. 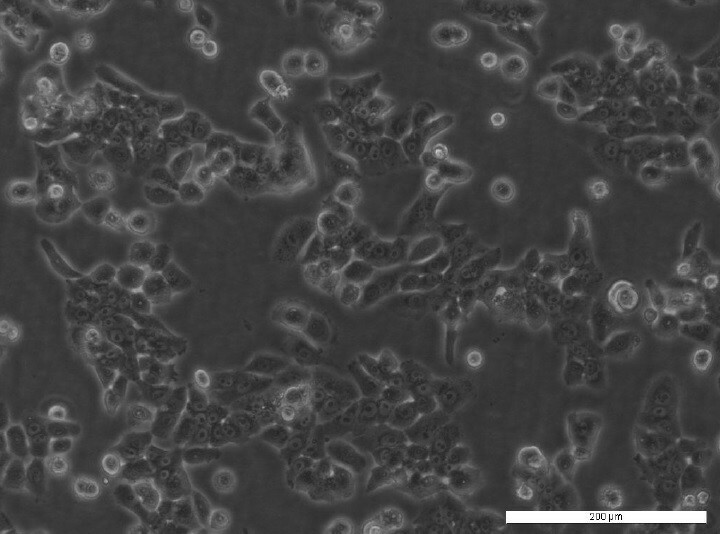 Split sub-confluent cultures (70-80%) 1:4 to 1:10 seeding at 2- 3 x 104 cells/cm2 using 0.25% trypsin or trypsin/EDTA; 5% CO2; 37°C. Doubling time approximately 37 hours. There are 26 reference entries for this reagent. Cruz et al. 2017. Cancer Genomics Proteomics. 14(1):35-51. PMID: 28031236. Coscia et al. 2016. Nat Commun. 7:12645. PMID: 27561551. A comprehensive survey of the mutagenic impact of common cancer cytotoxics. Szikriszt et al. 2016. Genome Biol. 17(1):99. PMID: 27161042. The role of HDAC2 in chromatin remodelling and response to chemotherapy in ovarian cancer. A Systems Oncology Approach Identifies NT5E as a Key Metabolic Regulator in Tumor Cells and Modulator of Platinum Sensitivity. Huang et al. 2015. Oncotarget. :. PMID: 26683361. Nevedomskaya et al. 2015. J Proteome Res. :. PMID: 26629888. Patel et al. 2015. Cell Oncol (Dordr). :. PMID: 26266765. Metformin and epithelial ovarian cancer therapeutics. Hearn et al. 2015. Proc Natl Acad Sci U S A. :. PMID: 26162681. Ren et al. 2015. J Steroid Biochem Mol Biol. 150:54-63. PMID: 25817828. Huntoon et al. 2013. Cancer Res. 73(12):3683-91. PMID: 23548269. ATR inhibition broadly sensitizes ovarian cancer cells to chemotherapy independent of BRCA status. Langdon et al. 1988. Cancer Res. 48(21):6161-5. PMID: 3167862. Langdon et al. 1988. Cancer Res. 48(21):6166-72. PMID: 3167863. Effect of sodium butyrate and other differentiation inducers on poorly differentiated human ovarian adenocarcinoma cell lines.